The Gregory Z35-R daypack is a great all around pack. I have the 2010 version and I specifically got it to replace my long time, best pack ever, Black Diamond Sidewinder. That pack was sweet, but it is time to relegate that pack to backup duty...I've had it for about a decade!!! The Z35-R is special because it is one of only two Gregory packs to incorporate the use of a roll top closure. This was an important feature to me as I despise top loaders that have a floating lid. They always get in the way, rarely sit correctly and really only offer a place to put food or quick access items (camera, knife, first aide, etc.). I will explain why it is not needed on this pack soon. Gregory is one of the best pack manufacturers around, probably one of the top 3-5 including Granite Gear, Black Diamond and Cilo Gear. The fit and function of Gregory packs is probably the best. Feature sets on their packs really outdo most competitors and the weight is in line with most other pack companies as well. Finding this balance is always the biggest issue with packs. This is probably why Black Diamond bought Gregory or more accurately the parent company merged the two. They can share technologies and experience and start combining features for super packs!!! Okay, onto the pack review. Z35-R with all my sport climbing gear. Harness, shoes, chalk bag, draws, rope (in rope bag), food, and water. This pack is sick. My medium size boasts about 2,300 cubic inches of space and that is great for a daypack meant for climbing, hiking, etc. Quick fyi, there are about 61 cubic inches in a liter. This means that if a pack is 36L in volume, like this pack for the medium size, then it is about 2,200 cubic inches in volume. Pack companies vary from this either way, but it is a good overall measurement. If you ever wonder "What will fit in this pack I am thinking about buying?". Just ask yourself "How many Nalgenes can I fit in the pack?". A 36L pack should be able to fit 36 Nalgenes, obviously not always uniformly, but you get the idea. Like I said, this pack is meant to be a technical pack with quick access areas, a large outside cantilever pocket, lash points for ropes and gear, and full compatibility for hydration systems. There are even hip belt pockets that can fit any point and shoot camera, knife, snack, etc. The hip pockets and cantilever stuff pocket make the top loader floating lid irrelevant. You still get the cargo room without the excess lid. One the best features of this pack is the way you tighten the waist belt. Instead of pulling out and having the buckle cinch down while you try to tighten, you pull in by using a redirected buckle system. There is no cinching action to stop the tightening. Companies just started doing this a few years ago and I don't know what took them so long. Genius!!! The Jetstream LTS suspension system makes this an extremely comfortable pack. It is meant to carry 30-40 lbs. and after using it for the better part of a year on climbing days I can say that a trad rack, rope, harness, shoes, water and food fit perfectly with room to spare for other essentials. It sits well on my shoulders and hips and the air channel on the back (Jetstream LTS) makes a sweaty back no problem. The lash points on the top of the pack accommodate a rope very well and adjust to different lengths to fit what you need. There are even lash points on the bottom for a sleeping pad or tent and the side compression strap tighten up your cargo for technical terrain where you need sure footing. A cantilever pocket on the outside provides ample expandable room to stuff clothing, trash, guidebooks and other items that otherwise get lost somewhere at the bottom of your pack. The fabric is durable and tossing around this pack is no problem. I have taken this climbing up and down the Frontrange of Colorado as well as climbing in Northern Italy and the abrasions are minimal and almost unnoticeable. Gregory always does a great job of constructing durable and tough product without adding additional weight. Even with the durability and beefy fabric options the pack still manages to breath pretty well too. 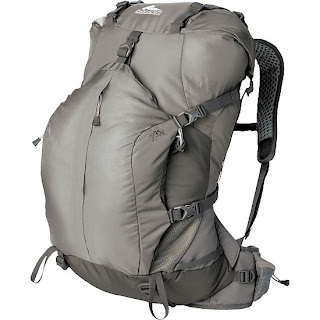 This is a pack with tremendous potential for climbing or day/weekend hiking. It has plenty of room with features that include hydration compatibility, hip belt pockets, multiple lash points and compression straps. Overall a great pack for technical use with the only drawback being its main advantage...roll top closure instead of a floating lid. can improve you judge to buy solid for wellbeing reasons.